KeyTours: Meteora: mysterious, wild & inaccessible landscape. Reach God. Meteora: mysterious, wild & inaccessible landscape. Reach God. 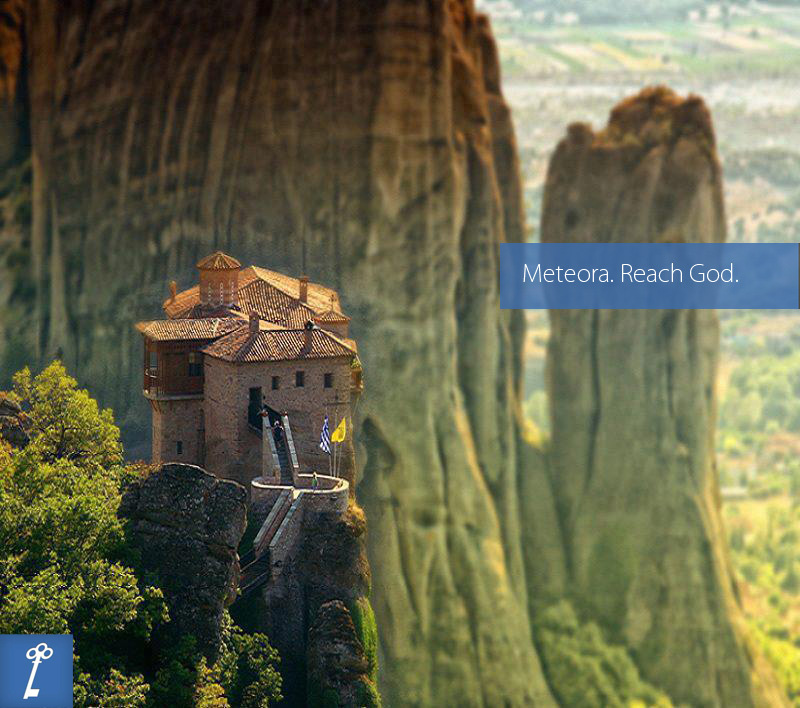 Being in Meteora is like reaching God. The wild, "suspended in the air" cliffs are really amazing and the panoramic view makes you feel dizzy. It’s a magical place with an inexplicable landscape. This phenomenon of huge cliffs with a great history is for many tourists a pole of attraction. In central Greece and particularly in the north-western part of Thessaly, between north-east Hasia and west Pindos, gigantic rocks rise, that create a spectacle that is unique worldwide. What makes Meteora so special is the monasteries on the top of the cliffs, the peaks that beckon viewers to climb and the paths, which offer endless hiking possibilities. The existence of these rocks have no reference neither in mythology nor by Greek or foreign historians. Meteora is maybe the most important complexes of Eastern Orthodox monasteries in Greece. The name "Meteora" is more recent and unfortunately there is not any report by ancient writers. Meteora is named by Saint Athanassios the Meteorite, owner of abbey of Metamorphosis of Sotiros (known as Big Meteore, too). Twenty-four of monasteries were built, despite incredible difficulties, at the time of the great revival of the eremitic ideal in the 15th century. According to the most valid sources, first monks moved in that region in 12th century. In the means of 14th century, monk Nile gathered those who lived in isolated caves of the rocks. Thus the monasticism in Meteora began. Visit Great Meteoro Monastery and St. Stefanos. Instead of Great Meteoro, visit also Varlaam monastery. Meteora, apart from being an important monument of Orthodoxy, constitutes a unique geological phenomenon; the single rocks reach 400m in height. Climbing on the Meteoritic rocks is an old activity. In ancient times, the inhabitants of ancient Aeginio found shelter in these rough rocks in order to be protected by the attacks of various robbers and pirates. Later and especially in the 9th century A.D. many caves were used as hermitages by monks. Many of these caves could only be reached by means of climbing. Meteora is very close to Kalampaka, Kastraki and Trikala city. You can access Kalampaka from Ioannina, Thessaloniki, Athens by bus or train or take one of multi days tours from Athens.Meteora is also included in the UNESCO World Heritage List. Tip: The entrance to the monasteries requires visitors to wear appropriate clothing, with long trousers and skirts and covered shoulders. Book your Keytours trip to Meteora that best suits you!